On full display is a man utterly changed by the Time War. While he is no stranger to speaking harshly to the Daleks, he is completely outnumbered and has no semblance of a plan when he does so this time, armed only with pride and anger. Not content with just winning, though, the Doctor mercilessly promises to destroy all of the Daleks once and for all while saving both Rose and all of Earth. It’s the final stand for the Ninth Doctor, and the odds have never been stacked more against him. While ‘Bad Wolf’ took a more flippant opening and slowly built up the drama and intrigue, ‘Parting of the Ways’ wastes no time in getting into the action and comes perilously close to showing just how far the Doctor would go when pushed to the brink. This is a very grim story, the Daleks exterminating anyone and everyone in a truly ruthless manner never before seen. With some like Roderick trying to hide and some like Lynda and the programmers forming a resistance group, every character who had been introduced in the preceding story is quickly dispatched in harrowing fashion; the Dalek fleet has launched an attack on Earth as well, entire continents appearing to melt and reshape themselves under the force and brutality. Clever use of visual and audio cues allow the off-screen death count to continue to rise, and it seems as though the Doctor will finally run out of time against an overwhelming force. The biggest criticism against the Ninth Doctor is that he’s not necessarily a man of action, instead serving as an inspirational force for others, and that does come into play here as well. His idealism and willingness to fight the hard fight serve as catalysts in bringing out the best in others; with other examples available, the decisive action was Rose’s against the Nestene Consciousness, Gwyneth’s against the Gelth, Mickey and Harriet’s against the Slitheen, and Cathica’s against the Jagrafess. ‘Parting of the Ways’ offers a different kind of threat to those instances, however, exactly what he faced in the Time War. This is absolutely a worst-case scenario for him, and the scene in which the devastated Time Lord presses his hand against the TARDIS door as he tries to shut out the screams of the Daleks outside is more telling than any speech could ever be. 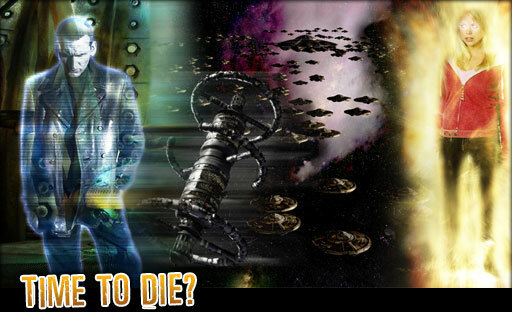 Facing insurmountable odds, his choice is either to die as the Doctor or as a killer, coming down to whether he would dare use the delta wave generator to destroy the Dalek threat at the expense of all of humankind on Earth. As is so often the case, though, the Doctor must be measured by the quality and actions of his companions. While there just wasn’t enough screen time in the season for Jack to have so fully bonded with Rose and the Doctor, he is at his absolute best in ‘Parting of the Ways,’ intrinsically trusting the Doctor and doing everything he is told even as he realises that it will cost him his life. His final scene in which he kisses both the Doctor and Rose goodbye is heartbreaking, and he fully redeems himself for his past life as he completes his transformation from selfish reprobate to selfless hero. Rose follows an altogether different path. Having been unwillingly sent back to Earth by the Doctor (with a truly heartbreaking speech delivered via hologram) to keep her safe, Rose delivers an equally impressive speech to Mickey and Jackie about everything the Doctor symbolises- never giving up and always continuing to fight. It’s fitting, then, that the overarching Bad Wolf comes to fruition through Rose, but only with the help of Mickey and Jackie as they effectively accept her destiny and break ties with any hope of her settling back into their everyday lives. Again, the concept of the Doctor bettering people is clearly exemplified. Finally, the meaning of Bad Wolf is explained as Rose looks into the heart of the TARDIS and absorbs the power of the vortex, spreading the words Bad Wolf through time as a message to herself. As a literal deus ex machina, it’s hard to say that the events of ‘Boom Town’ set up this plot development well enough. As it is, though, the plot device itself is very effective as Rose, given near godlike powers, promptly dismantles the Dalek fleet, at the same time bringing Jack back to life and offering salvation to the Doctor who had refused to commit genocide of two races. Rose can see and feel the universe but is being torn apart by the power; the Doctor, respecting her more overtly in that moment than perhaps ever before, must take that power away from her to save her life. Seemingly unaware that Jack is alive, the Doctor quickly starts up the TARDIS and leaves the scene. In a truly heartbreaking scene as the Doctor finds himself likewise unable to handle the power of the vortex, the Doctor explains the regenerative process to Rose and the audience alike. Trying to keep a sense of levity and bravery, the pain he is experiencing and the pride of everything he and Rose have accomplished is blazingly apparent and, just like that, he explodes into a shower of energy with David Tennant ready to take the reigns. ‘Parting of the Ways,’ overall, is a fantastic finale for the first series of modern Doctor Who, with production values, effects, and a musical score fitting for the momentous and powerful scenes on display. In this case, the deus ex machina is not a result of sloppy writing as is often the case, but it still just didn’t feel completely earned even if it did effectively guide the plot to ‘victory’ and the regeneration. Still, it brought the Ninth Doctor’s time to a satisfying close even as he failed to fulfill his promise made at the end of ‘Bad Wolf,’ allowing him to portray a full range of emotions, to continue to inspire others, and to be pushed to the brink. This was a Doctor who seemed eerily at peace with the prospect of dying, having come dangerously close to sacrificing himself at multiple points throughout the preceding episodes, and he again seemed most at peace here when on the verge of regeneration. For only appearing in thirteen episodes, though, Eccleston made a lasting impact and, along with strong companions in Rose and Jack, blazed a clear path for Doctor Who‘s return and continued renaissance.